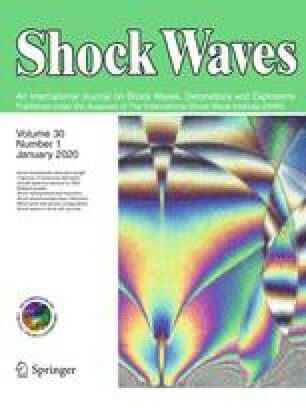 A Free-Lagrange CFD code is used to simulate the collapse of a cylindrical air cavity in water by a 1.9 GPa incident shock. The Lagrangian treatment allows the air/water interface to be tracked throughout the interaction. The incident shock is partially transmitted into the cavity, within which it experiences multiple reflections. The upstream cavity wall involutes to form a high-speed jet which, on impact with the far cavity wall, produces an intense blast wave. Heating of the gas within the cavity is highly non-isentropic, and is dominated by shock heating. The predicted final gas temperature is of order 12000 K, although the modelling assumptions used here lead to over-prediction of temperature during the later stages of collapse.